Abstract : In motion analysis and understanding it is important to be able to fit a suitable model or structure to the temporal series of observed data, in order to describe motion patterns in a compact way, and to discriminate between them. In an unsupervised context, i.e., no prior model of the moving object(s) is available, such a structure has to be learned from the data in a bottom-up fashion. In recent times, volumetric approaches in which the motion is captured from a number of cameras and a voxel-set representation of the body is built from the camera views, have gained ground due to attractive features such as inherent view-invariance and robustness to occlusions. Automatic, unsupervised segmentation of moving bodies along entire sequences, in a temporally-coherent and robust way, has the potential to provide a means of constructing a bottom-up model of the moving body, and track motion cues that may be later exploited for motion classification. Spectral methods such as locally linear embedding (LLE) can be useful in this context, as they preserve ''protrusions", i.e., high-curvature regions of the 3D volume, of articulated shapes, while improving their separation in a lower dimensional space, making them in this way easier to cluster. In this paper we therefore propose a spectral approach to unsupervised and temporally-coherent body-protrusion segmentation along time sequences. 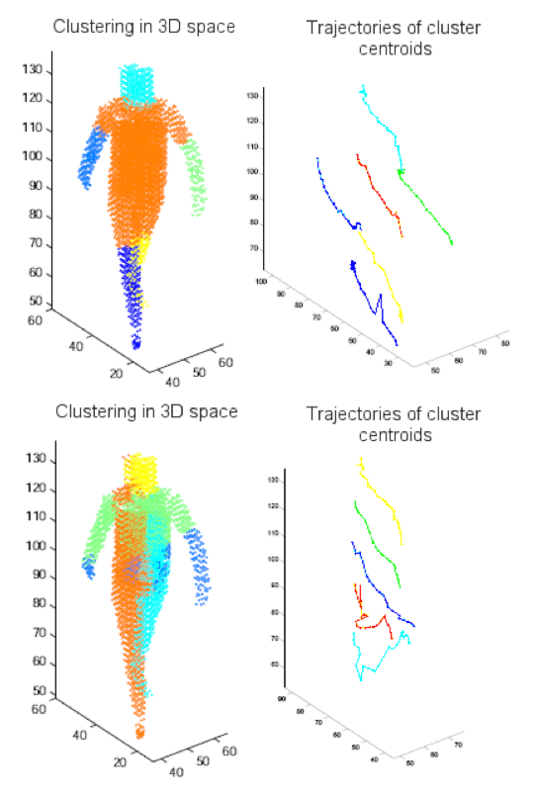 Volumetric shapes are clustered in an embedding space, clusters are propagated in time to ensure coherence, and merged or split to accommodate changes in the body's topology. Experiments on both synthetic and real sequences of dense voxel-set data are shown. This supports the ability of the proposed method to cluster body-parts consistently over time in a totally unsupervised fashion, its robustness to sampling density and shape quality, and its potential for bottom-up model construction.